Cufflinks first came into being in the French courts of Louis XIV as the result of the fashion of ruffled cuffs which required some mechanism to hold them together once the arm had been drawn through the sleeves. The boutons de manchette, or “sleeve buttons,” were the forerunner of the cuff links being constructed of 2 coloured glass buttons joined by a single chain link. By 1715 however we see examples of valuable stones, usually diamonds, joined by expensive gold chains. Soon after this we see the development of customized cuff link designs which often included either initials or crests of various descriptions. So began the process of engraving cufflinks. It also became more and more fashionable to match the designs of cufflinks with other man’s jewelry notably their rings. As these often held the designs of family crests as referred to in our article about Signet Rings, It was an obvious move to include these heraldic family crest designs on cufflinks as well. Monograms became popular as did plain initials as cuff link wearers seek to express their individuality. Nowadays corporate emblems and virtually any design can be found adorning cufflinks but the designs are usually related to some individual aspect of the wearer whether it be family heritage, a hobby, a sport or a belonging to some organisation. At Regnas we favour the engraving of semi precious stones as an alternative to gold or silver. We love the individuality of every natural stone and consider this adds extra charm and interest to our range of cufflinks. Red Agate, Black Onyx, Bloodstone, Lapis and Rock Crystal are among the stones we find suitable for engraving. We also have 3 distinct variations to our methods of working the stones. 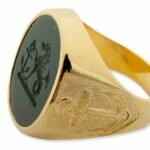 We engrave into the stone in the traditional way as seen in the heraldic crest cufflinks above. We also sculpt designs from the stone as the cameo craftsmen have done since Roman times. Although cameos are strictly carvings with 2 contrasting colours our method of engraving in this carved style is along the same lines and creates wonderful clear relief designs such as these Masonic Red Agate swivel cufflinks. This is another method of applying design to our cufflinks. It requires a stone with some degree of translucency so that the design will show through the oval or cabochon to which it is engraved. Rock Crystal is perhaps the most transparent of all our stones and by reverse engraving the design to the bottom of them, and mounting them to the cuff link chassis, we get some wonderful effects such as these Templar Cross links. Certainly there is some choice when it comes to selecting engraved cufflinks but not only in the design but also the methods of engraving. 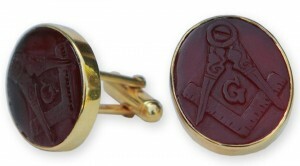 You can view a selection of Regnas engraved cufflinks here. Stone signet and seal rings have a unique place in history. Find out what make Regnas stone rings so valuable.